These pix are from Larry Michelon. Thanks for the ideas, Larry. Here are some pictures of my 235/85 in the spare location. One thing to note. I did cheat a little. I opted for a used spare tire (primarily for money savings), so it had considerable less tread than a new tire. A new tire would be a tighter fit and would depend on the brand and actual diameter. The pictures are pretty low resolution. I can get better pictures if you need. 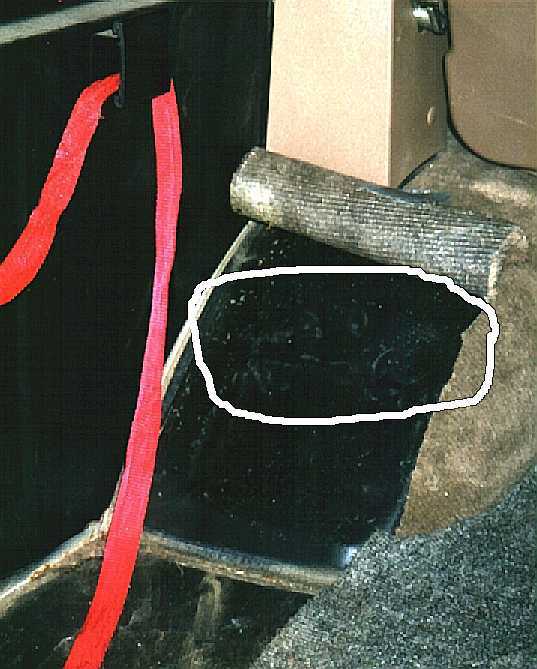 I have circled an area just above the existing dimple in the fender well ("hammerpaint"). This is where I increased the size of the dimple in the up direction. One hit with the hammer was all it took. 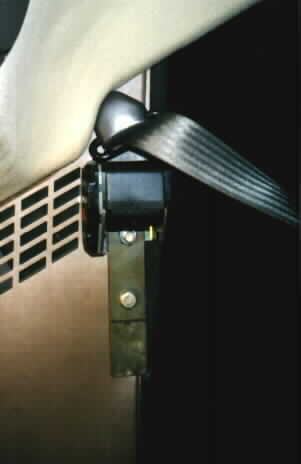 There is a picture of the seatbelt extension bracket before ("bracket") and after installation ("beltin"). The black line is where I needed to cut the excess length off. I basically moved the retractor up as far as I could without it binding on the turn around. I drilled the anchor hole first and then marked the retractor hole while holding it in place. 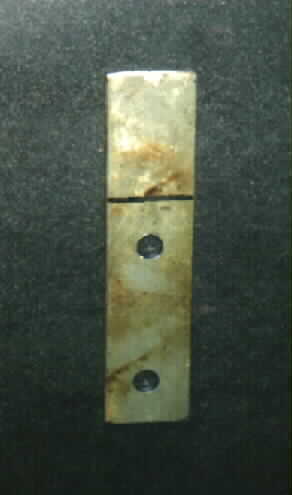 I through bolted the retractor with new grade 8 hardware and reused the existing anchor bolt. It worked perfect until I reinstalled the rubber boot, so it jambs a little when retracting all the way. I strapped in the spare ("tirein"). 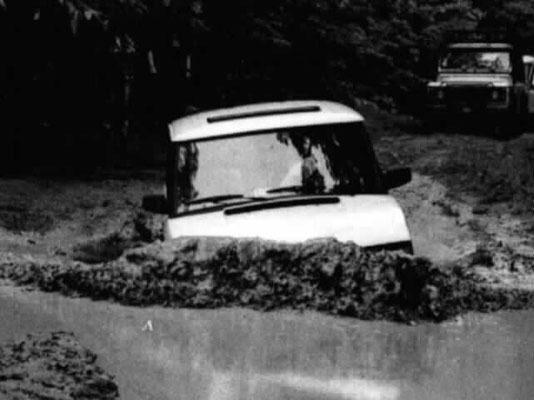 It has never budged during heavy off-roading. The strap goes around the back of the tire and through supports on the bulkhead. One trick to really get it tight was to pull the strap back through the center hole and around a bar that can not go back through the center. This really keeps it tight against the bulkhead (like the original screw hold down.) 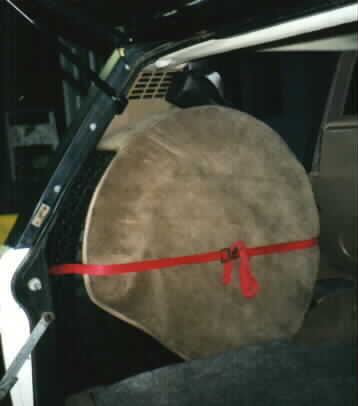 The soft cover can be slipped on prior to tightening the strap. The hard cover was modified by cutting the two top, inner corners. It can barely be seen in the "finalfit" picture. Next up is 255/85's. I've designed a stowage system that will permit the spare tire to lay flat on the floor and it can be pulled out from the rear. 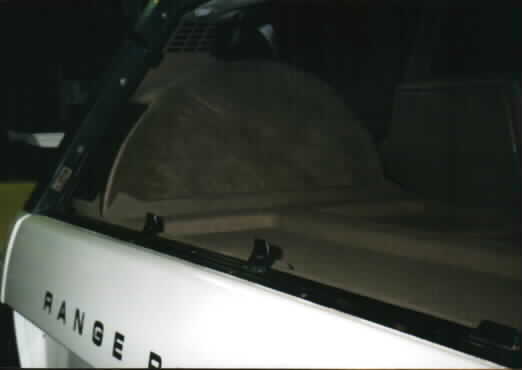 There will be stowage to either side of the tire with access from above, as well as the corners in front of the spare tire. The intire floor will be flat from left to right bulkhead. I shouldn't loose too much volume, but it will make the entrance kind of low. The center tire section can be pulled out separately to permit larger items if needed. Should have it done by the fall.